Last September, the popular college schedule planning service MyEdu shut down, leaving their more than 1 million users with no explanation or alternative. The shutdown took place two years after MyEdu was acquired by the education giant Blackboard and coincided with the end of MyEdu's contract with the University of Texas system. When the Coursicle team discovered that MyEdu was shutting down, we began adding support for as many colleges as possible. By the end of August, we had doubled in size from 100 to 200 supported colleges. In October, we focused on adding the colleges where MyEdu was most widely used, such as UT Austin and Texas A&M. We'll continue to broaden our expansion as we try to fill the gap that MyEdu has left, but there's a lot more work to do. At the time of its closure, MyEdu supported over 800 colleges. However, where we lack in breadth, we hope to make up in function. As important as it is to plan a schedule before registration, we know that actually getting into those classes can also be incredibly difficult. That's why Coursicle not only offers a course scheduling tool—similar to MyEdu's—but also an app that notifies students as soon as a class they want has an available seat. 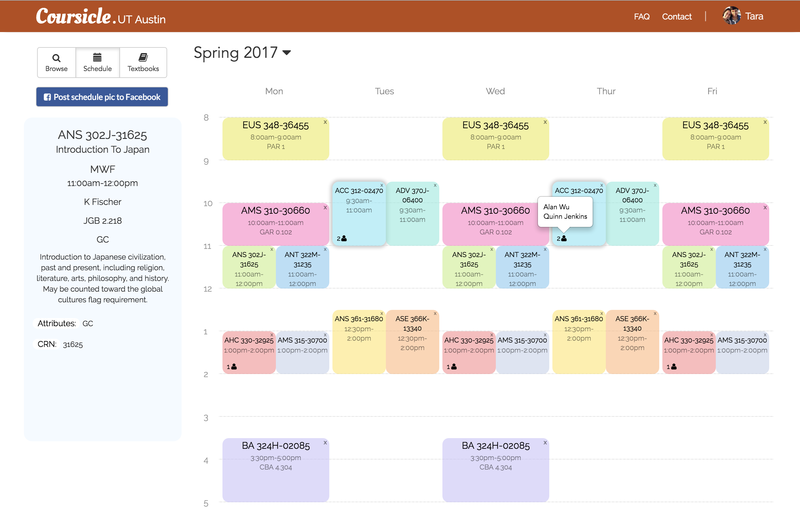 Just like MyEdu, Coursicle allows students to view all the classes they're interested in taking on a weekly schedule view. Using this view, students can easily determine a suitable schedule by narrowing down classes based on time-conflicts. Moreover, students can create multiple schedule options, such as a few back-up schedules, in case certain classes have no open seats during registration. The Coursicle app allows students to track classes and receive notifications as soon as seats open up. The app currently supports more than 130 colleges and can be downloaded here. In a post-MyEdu world, we hope that Coursicle will be able to make the registration process a bit better. As always, if you have any questions or want us to add support for your college, please don't hesitate to contact us.